Dorie was just a hash slinger. He wasn’t trained on handguns, let alone anti-aircraft guns. But his shipmates needed him. “It wasn’t hard,” Dorie explained. “I just pulled the trigger and she worked fine. I had watched the others with these guns. I guess I fired her for about 15 minutes. I think I got one... they were diving pretty close to us.” He stayed at the gun until he ran out of ammo. Then he refused to leave his new post until he was ordered to abandon ship. Dorie earned the Navy Cross that day, pinned to his chest by Fleet Admiral Chester Nimitz. A couple of years later, Dorie’s new ship was sunk by a Japanese sub. This time, he didn’t make it. In his honor, a new warship was named after Dorie. FF-1091, the USS Miller. The photo above holds a special resonance for me. 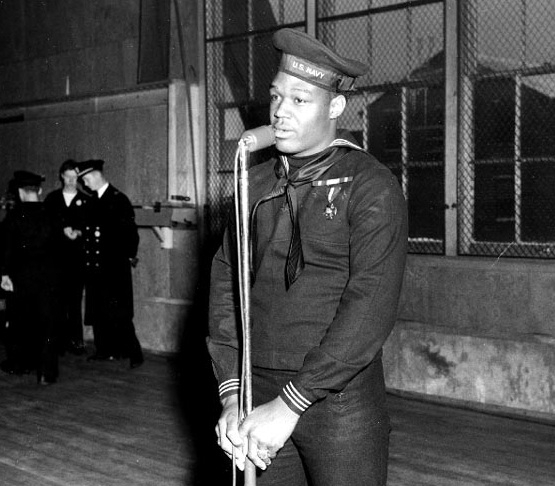 Dorie Miller is standing upon the same warped floorboards I marched alongside my Navy bootcamp drill team in Great Lakes, Ill. Thankfully, I never had to fight active battles, but enjoyed the luxury of merely maintaining the peace. Since my submarine was based out of Pearl Harbor, I often looked across the waters and skies and wondered what it must have been like that awful Sunday morning 72 years ago today. Thanks to heroes like Petty Officer Miller, I never had to experience a “day of infamy” firsthand. This article was originally published on Dec. 7, 2012.